Making your own Bowl Gouges. I'm sure you know the story: you are trying to take a finishing cut in the bottom of a deep bowl and things are beginning to get snatchy because you can't keep the bevel in contact. You wish you had an extra gouge so you could grind a much steeper bevel on it for just this application, but you can't justify the outlay on a specialized tool. 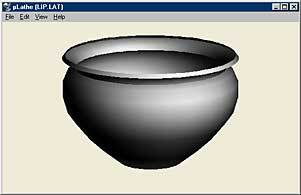 Ever wanted to preview your bowl in 3D before you start turning it? Microlathe allows you to draw a profile and then see what it will look like as a turned 3D object viewed from any angle. And you can make changes to the profile and see their effects on the finished form. The individual node points along the profile line can be dragged to adjust the form and the 3D view updates automatically. The profile can be printed and used as a pattern in the workshop. Microlathe was written by Daniel S. Baker in the days of Windows 3.1 but still works on most later Windows machines. It doesn't require installation (so it doesn't make any changes to your system), simply download it and save it to your hard drive, then unzip the zip file to a suitable folder. Double-click the Lathe.exe file to run it.